Meeting the challenge of K3 Option 72 Reshebnik on theoretical mechanics manuals SM Targ 1983. A rectangular plate (Fig. K3.0 K3.5-) or a circular plate of radius R = 60 cm (Fig. K3.6 K3.9-) rotates about a fixed axis at a constant angular velocity ω given in Table. K3 (with minus sign ω direction opposite to that shown in the figure). The rotation axis in Fig. 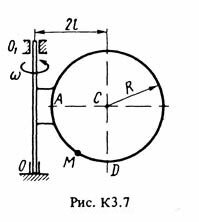 K3.0 K3.3 and K3.8,, K3.9 perpendicular to the plane of the plate and passes through the point O (plate rotates in its plane); Fig. K3.4 K3.7 OO1-rotation axis lies in the plane of the plate (plate rotates in space). In the BD plate along a straight line (Fig. K3.0-K3.5) or circle of radius R, t. E. On the rim of the plate (Fig. K3.6-K3.9), moving point M. Law its relative motion, expressed by equation s = AM = f (t) (s - in cm, t - in seconds) specified in the Table. R ^ separately for rice. K3.0 K3.5, and Fig. K3.6 K3.9, while in Fig. 6-9 s = AM and is measured by the arc of a circle; ibid given dimensions b and l. In all the figures the point M in the position shown, in which s = AM> 0 (if s <0, the point M is on the other side of the point A). To determine the absolute speed and the absolute acceleration of the point M at time t1 = 1 sec. After payment you will receive a link to a zip archive with the solution of K3 option 00 on the theoretical mechanics of Reshebnik Manuals Targ SM 1983 for part-time students. The task performed by the methodical instructions and control tasks for part-time students of thermal power, mining, metallurgy, electro-instrument-making, automation and technological specialties universities. After downloading the solution of the problem, please leave a positive review. Feedback can be left at any time by clicking on the download link.